"The world is what it is; men who are nothing, who allow themselves to become nothing, have no place in it." So begins V.S. 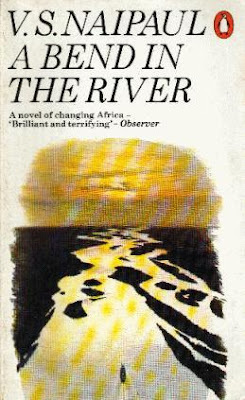 Naipaul's classic of African literature. My last week in Oman had me searching for something to fill the spaces between the history and physics reading. I was pleased to pick up A Bend in the River a masterpiece from an extraordinarily gifted writer. I must tell you I "finished" it in two days. I say "finished" because my copy ends on page 286, as Salim the narrator heads downriver, escaping from the small town in the Congo where he has made his life. The last page is a like an ending, but I am left mysteriously wondering if there is more from Salim, whether the narrative has room for his other life at the end of that steamer voyage. Instead, the last few sentences read: "the sky hazed over, and the sinking sun showed orange and was reflected in a broken golden line in the muddy water. Then we sailed into a golden glow." A full stop, but not an ending. Naipaul has both fascinated with his brilliant prose, and vexed with the often reactionary observations of his narrators, so much like autobiography. The man has undeniable talent, but I felt as I did when reading Paul Theroux's book Dark Star Safari; the man is grouchy, content with his sweeping views of 'Africans' and seemingly obsessed with the achievement of Europeans in contrasting his society with theirs. In this way the book reminds one of Heart of Darkness Perhaps this is a particular feature of our narrarator that Naipaul has captured with great skill, but, having read other of Naipaul's work, I suspect that Naipaul is able to write so penetratingly into Salim's mind because he himself feels the ambivalence of place, the loneliness, and the slight contempt of the privileged outsider. Salim's family is from Africa, part of an Indian trading caste (the Khoja) who were originally Hindus but converted to Islam, particularly Ismaili Shi'a Islam. Salim introduces himself as an outsider/insider: "The coast was not truly African. It was an Arab-Indian-Persian-Portuguese place, and we who lived there were really people of the Indian Ocean. True Africa was at our back. Many miles of scrub or desert seperated us from the up-country people; we looked east to the lands of with which we traded--Arabia, India, Persia. These were also the lands of our ancestors. But we could no longer say that we were Arabians or Indians or Persians; when we compared ourselves with these people, we felt like people of Africa." Salim feels insecure in his family, because they are static, falling behind in changing times. He wishes to get away. He lacks the religious conviction of his fathers and brothers and does not have a temperament like them to be "buried so deep in their lives that they were not able to stand back and consider that nature of their lives." This pessimism of Salim's "can drive men to do wonders" and it pushes him into Central Africa as a shop owner in Kisingani (one of the many way stops for the ivory trade, it was founded in 1883 by Henry Stanley). But even there, he writes of his displacement and loneliness, in a deliberate way: "I seperated myself from them. I still thought of myself as a man just passing through. But where was the good place? I couldn't say. I never thought constructively about it. I was waiting for some illumination to come to me, to guide me to the good place and the 'life' I was still waiting for." "The Europeans could do one thing and say something quite different; and they could act in this way because they had an idea of what they owed to their civilization. It was their great advantage over us. The Europeans wanted gold and slaves like everybody else; but at the same time they wanted statues put up to themselves as people who had done good things for the slaves. Being an intelligent and energetic people, and at the peak of their powers, they could express both sides of their civilization; and they got both the slaves and the statues"
This dynamic finds expression in the affair he begins with Yvette, the young and beautiful wife of a European professor whose 'expertise' on this region of Africa is a penetrating example of the uses and misuses of historical knowledge. Salim reads the scholar's articles and eats with him and Yvette in their home, and then leaves to be with the latter at his house. He finds their company stimulating and it takes away his loneliness; this is the optimistic period where Salim and others in the new African university (The Domain) live "in the companionship of that pretence, to feel that...we all lived beautifully and bravely with injustice and imminent death and consoled ourselves with love." Salim's discussions with his friend Indar reveal one of the book's dynamic figures. Indar leaves Africa, goes to university in London, and returns as a Lecturer in The Domain. Indar, like Salim, wanted more, but unlike Salim, he was rich and more ambitious. He tells Salim, "I found myself growing false to myself, acting to myself, convincing myself of my rightness for whatever was being described. And this is where I suppose life ends for most people, who stiffen in the attitudes they adopt to make themselves suitable for the jobs and lives that other people have laid out for them." Of course, the affair ends badly, the situation under the unnamed but obvious character of The President (Mobutu) gets steadily worse, and Salim has to flee. The plot is simple, and the characters, when they are not Indian or European, seem curiously immune from Salim's otherwise penetrating interior gaze. Rarely do we see or hear about the inner life and thoughts of any African from Salim. Even his closest companion, Metty, the mixed Indian-African, is always there attendant to Salim's needs, obsequious, and seemingly concerned only with his female liasons. In the end it is Metty who Salim suspects of betraying him, after Salim tells him he can no longer take care of him. None of the African women Salim sleeps with in the brothels merit so much as a name, and there are only two other African characters who are given any narrative importance. One is Zabeth, a customer from a forest village who Salim admires for her enterprise and attachment to her village traditions. The other is her son, Ferdinand, a boy who grows into a man during Salim's stay in the Congo. I felt Ferdinand was more of a narrative device than a true character, he exemplifies for Salim the ambivalence he feels about the new generation of Africans. For Ferdinand was put in Salim's care by Zabeth, and at each juncture of the novel, Ferdinand straddles the ideological and social debates of post-colonial Africa: loss of tribal allegiance, European education, the African personality. Eventually it is he, as a newly appointed appendage of the post-colonial state, who saves Salim's life. I always feel a sense of quiet pessimism upon finishing Naipaul's work. His prose tends towards the themes of decay and stagnation, loneliness and the loss of stability in the world. As a writer he must have struggled with this most explicitly as an Indian from Trinidad who was educated at Oxford. I suspect that in writing this book, Naipaul drew quite heavily on his own 'African experience' as an Indian minority in a majority African, postcolonial country. There are bits of him in both Salim and Indar. Of course, writing is autobiography, so this shouldn't surprise, but it ought to make one aware that the position of relentless outsider is not the only legitimate position of a writer, but the product of a unique background. (see Alan Nest's excellent review of the book which touches on this) I can identify in some ways with Naipaul's internal anguish. But I am still debating whether one has to, like Ferdinand, choose an identity and be subsumed by it, or pay the price of loneliness and exile like Salim for the sake of writing with a critical distance. I am not sure this is even the correct way to frame this debate. Can one maintain a critical distance, be true to oneself, and still be a participating member of a given community. Is it really that easy? Is 'fitting in' worth the inevitable price? Are these questions only relevant to those who, through some trick of fate, have lost their own true identity? For historians and anthropologists who want to consider the value of their own knowledge and who they produce it for, these are essential questions to fit within an ongoing critical self-analysis.